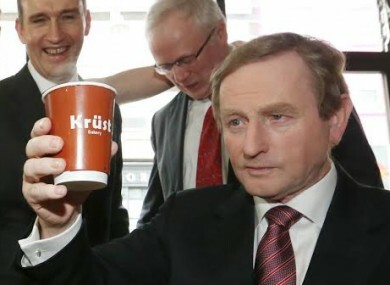 Enda Kenny with a cup of coffee that maybe he wishes was a pint. ENDA KENNY IS often fond of regaling the Dáil with stories about ordinary people he has met in the course of his travels around the country. It could be the man or woman he met on the short walk from his Dublin city apartment to Government Buildings, the woman who had driven from Cavan or the man he met on a building site. But yesterday, the Taoiseach, in an attempt to point how little people have to pay for water, told the Dáil about the man with two pints in his hand. The Government, having listened very carefully to people, set a charge of €1.15 per week or €3. The man who stopped me with the two pints in his hand last week shouting about the cost of water that he could not pay. First things first, a man with two pints in his hand? Even Gerry Adams couldn’t believe such a thing. “Two pints in one hand?” the Sinn Féin leader asked across the chamber. They must be some big hands, right? Although we know he’s on a group water scheme, so probably not. I said to him [that] what he was holding in his hands would pay for water for him – because I know him – for nearly ten weeks. Who is this man and is he the same man that Kenny previously told the Dáil about? One man? Two different men? One hand? Or two hands? If you’re the man who met Enda with two pints in your hand or in your hands please get in touch with us in the comments below. Read: Has Enda Kenny never seen a cup before? Email “The curious case of Enda Kenny and the man with two pints in his hand”. Feedback on “The curious case of Enda Kenny and the man with two pints in his hand”.